Earlier this month I told you some stamps are in the “I JUST NEED TO COLOR THAT” category – this is one of them! 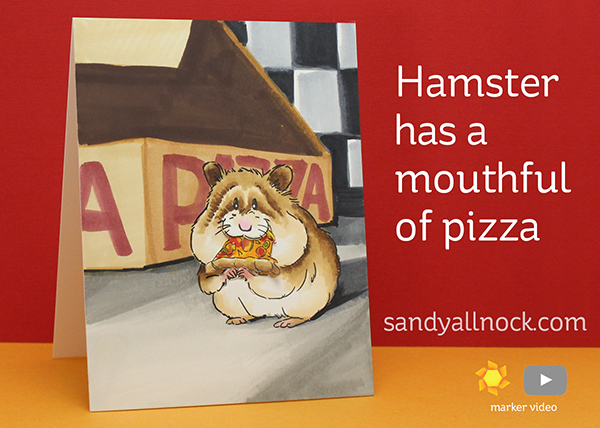 (For hamster lovers, it might be a must-have.) And I stand by it – he’s cute as all heck! Especially with pizza….. Watch the video below or click HERE to see it in HD on YouTube. Oh My Goodness Sandy!! This little guy is ADORABLE!!! Love to watch your videos. I learn so much from you. Thank you so much!!! Your coloring is amazing, as usual. 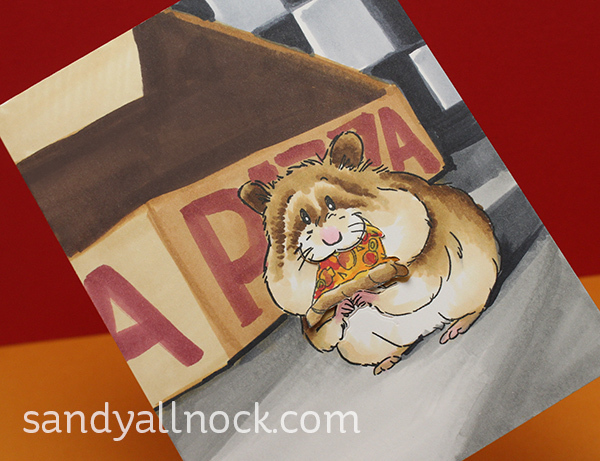 That hamster makes me think of me with my cheeks packed with pizza! He’s so cute. Absolutely as cute as can be! This is an adorable card!! Cant wait to see more of this cutie! This is a great card. Dawn over your coloring all you want, just fabulous. I worked at Pizza Hut for many years in my younger years and I would have loved it one of the regulars have me this card. Haha, I am one of the rare creatures who might actually go looking for this video on YouTube, since I could not resist this stamp set when I saw it on Blitsy last month and my order arrived last week. Maybe I’ll try to colour along with your video, and I will definitely check out IG for alternative versions. Love the small images and punny sentiments that come with this set as well. Last year, I joined Catherine Pooler’s StampNation, where we can sign up each month to send out newly created card (based on a theme or inspiration photo) to an assigned fellow member and then share the cards we receive online. A great incentive to create cards and send them as well, sharing kindness. Snail mail must never die!!! Making cards through these long Heartland winters is the only thing that keeps me sane from the dreaded Cabin Fever!!! This little guy is a great tonic – I’m sitting here drinking my first coffee of the day, laughing all the way thru your video because that fat little hamster is the funniest thing I’ve seen since it started snowing 3 days ago!!! Thank You Thank You Thank You Thank You Thank You Thank You Thank You Thank You !